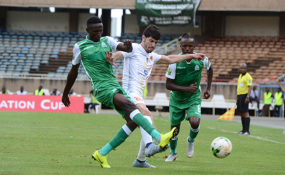 Kenneth Miguna of Gor Mahia, left, vies for the ball with Faouzi Yaya of NA Hussein Dey as Francis Kahata, right, closes in during their CAF Confederation Cup match at Moi international Sports Centre Kasarani on February 24, 2019. Gor Mahia's Rwandan forward Jacques Tuyisenge is at the centre of a whopping Sh50 million transfer merry-go-round involving Congolese club AS Vita, Moroccan team AS Berkane and DR Congo forward Jean-Marc Makusu Mundele, Nairobi News understands. As per media reports in Kinshasha, AS Vita are bracing themselves for a Sh50 million bid from the North African side for Mundele's services. Should that move materialize, the Congolese side will turn their attention towards the Amavubi Stars forward and are reported to be keen on channeling half of that amount towards capturing Tuyisenge as a replacement. AS Vita value Tuyisenge at Sh25 million with Gor Mahia expected to pocket about Sh20 million as transfer fee. The rest of this amount will be paid to the player as signing bonus. Should Gor refuse to play ball and release Tuyisenge, AS Vita are also prepared to wait until June 2019 when the Rwandan forward will have six months remaining on his current deal at the club, and then entice him into a pre-contract deal for a move as a free agent when his contract with Gor Mahia expires. This alternative will save the 2018 Caf Confederations Cup finalists Sh15 million, as Gor will receive nothing and Tuyisenge will be paid a Sh10 million bonus. Tuyisenge has been a sensation since joining the Kenyan champions from Rwandan side Police for Sh4 million three years ago with his goal against English Premier League club Everton in Dar es Salaam perhaps the highlight of his career. AS Vita were particularly impressed with Tuyisenge's performance in the Caf Confederations Cup this season, notably his four goals against Egypt's Zamalek, Algeria's NA Hussein Dey and Angola's Petro Atletico in the group stages.